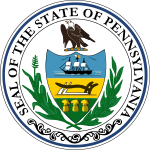 The Pennsylvania gubernatorial election of 1817 occurred on November 4, 1817. Incumbent Democratic-Republican governor Simon Snyder was not a candidate for re-election. Simon's preferred successor, State Treasurer William Findlay, was nominated as the Democratic Republican by a caucus of legislative leaders. Conversely, U.S. Representative Joseph Hiester was chosen as a candidate by the Democratic Republican's first popular nominating convention; he additionally gained the endorsement of the declining Federalists. The two men ran starkly different campaigns. Findlay sought to continue aggressive policies of infrastructural investment and economic intervention while maintaining the patronage system for governmental employment. Heister, a former Revolutionary War captain, called for a reduction in spending, an expansion in liberal economic policies, and an investigation into corruption in state government. Findlay was ultimately victorious by an approximately six point margin, as his dominance in the state's rural counties counteracted support for Heister in the cities. This page was last edited on 17 January 2019, at 01:39 (UTC).